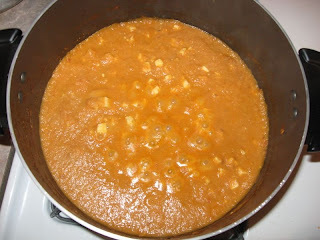 Paneer...WOW..I Love Paneer.Lots of items can be made with this paneer.Curries and even yummy n delicious sweets like Rasmalai and Rasgulla..most popular Bengali Sweets...Here is the recipe for making Paneer Butter Masala..which goes good with Indian Bread.I often make this curry or Palak Paneer for Roti. 1.Put a pan on flame and pour little oil and let it heat,now add cumin seeds and fry till they splatter.Now add chopped onions and fry them till they turn smooth,add salt at this stage so that the onions become smooth in less time. 3.Add cumin powder, coriander powder, chilli powder, turmeric,garam masala and cashews.Fry till all the ingridents leave raw flavor. 4.Now its time for us to add chopped tomatoes and stir well and cover it with a lid, cook well till tomatos becomes smooth.Turn Off the flame and let the mixture cool,Blend the mixture into smooth paste and put aside. 6.Put a pan and add little oil and cook the blended mixture,add the fried panner when the gravy is cooked. 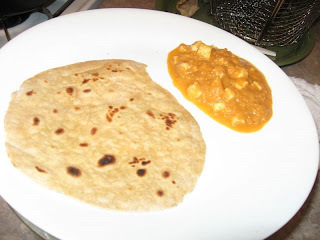 7.Finally add butter to the curry and serve it hot with any Indian Bread. 1.When ur paneer is fresh u need not fry the paneer.Dont over fry Paneer,this may makes the Paneer hard. 2.If u want good color to your dish you can even add few drops of red food color.